MONTREAL — Jujhar Khaira hopes he is finding his groove with the Edmonton Oilers. 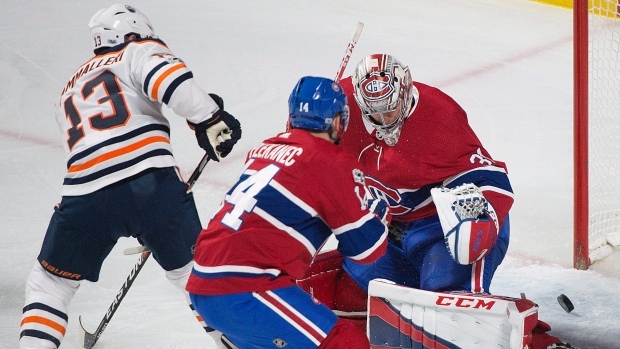 The 23-year-old winger scored twice in a game for the first time to help the Oilers to a 6-2 rout of the Montreal Canadiens on Saturday night. That gave the Surrey, B.C. native five points in the four games since he returned to the lineup after being scratched for a pair of contests. "Playing the last few games, I built confidence and I'm getting confidence from my teammates," said Khaira, who has been in and out of the lineup since the start of the season and has five goals and nine points in 16 games. "It's nice coming to the rink. "There are always words of encouragement. Just having that on your side, you go out there with a lot of confidence." Khaira's goals helped chase listless Montreal starter Carey Price 2:24 into the second period after four goals on only 13 shots. Antti Niemi allowed two more goals on 27 shots. "I know I can play in this league but it always takes some time to figure it out," said Khaira, a third-round draft pick in 2012. "You play little stints here and there the last couple of years, but being on the team regularly is definitely different. "Over time I'm slowly learning. I'm getting a lot of help from the players and coaches and I'm just trying to help the team as much as I can." Mike Cammalleri, Milan Lucic, Oscar Klefbom and Yohann Auvitu also scored for the Oilers (12-15-2), who face the Maple Leafs in Toronto on Sunday night. Edmonton has won four of its last six games and five of its last eight. Alex Galchenyuk and Phillip Danault scored for Montreal (13-14-4), which is winless (0-2-1) in three straight home games since going on a five-game wining streak. The Canadiens had 24 shots on Laurent Brossoit. "A game like that; you know how Detroit felt after we beat them 10-1 (on Dec. 2). We felt a bit like that tonight," said Montreal coach Claude Julien. "You know the importance of the game. "I'm not brushing it off, but I've got to get ready for the next game (Thursday night against new Jersey). We need to get better at winning battles for loose pucks." Cammalleri, a former Canadien, broke in alone and saw his wrist shot trickle through 7:36 into the game. It was Cammalleri's third goal in three games against Montreal this season, having scored twice while a member of the Los Angeles Kings before his trade to the Oilers. He will face them again Dec. 23 in Edmonton. "I don't think it has anything to do with Montreal, but there's no doubt that I enjoy playing against the Canadiens in this building and I enjoyed playing for the Canadiens," said Cammalleri. Price made a deft move to stop a shot in behind his net, but then saw his soft pass picked off by Ryan Strome and sent to Khaira, who jammed it in before the goalie could get back at 11:37. Price was slow to get across his net as a rebound came off the end boards for Khaira to shoot into an open side 1:11 into the second frame. Lucic scored a power-play goal on an off-wing wrist shot from the right circle at 2:24, prompting the goaltending change. Connor McDavid got a point in a fourth straight game on the play. Asked how he felt about getting the hook, Price said "well, I didn't wake up this morning hoping to get pulled." "It was a big game for us. Saturday night. But we fell flat." Galchenyuk drifted to the front of the net in time to redirect Jeff Petry's feed past Brossoit on a power play at 13:44. Brendan Gallagher took two minor penalties early in the third and Edmonton capitalized on the second one as Klefbom's point shot went in off Montreal defenceman Karl Alzner's skate at 2:39. Auvitu finished a rush with McDavid and Jesse Puljujarvi at 3:09. Danault got one back at 15:58. Jonathan Drouin returned after missing four games for Montreal.